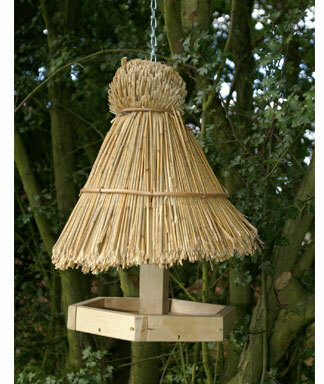 An attractive thatched bird tables that will enhance any garden. Featuring a distinctive and attractive real thatch roof and an solid wood base with frame in a oak. It can be used either as a garden focal feature, or easily integrated within the garden environment. It is natural for wood to move in different weather conditions and small cracks may appear which will not affect the construction. This is a unique attractive and functional Apple House made from with rustic natural bark roof. The Apple House features a unique circular landing platform (helps landing species to feed) and stainless steel spike, which can be used to fix a variety of foods from apples, to fat balls or bread and kitchen scraps. This lovely ceramic bird bath has the first stanza of the inspirational William Blake poem 'Auguries of Innocence' inscribed around the edge. 'To see a world in a grain of sand, And heaven in a wild flower, Hold infinity in the palm of your hand, And eternity in an hour.' Durable and sturdy, it's made from high-fired frost resistant ceramic and stands on three small ceramic feet. The attractive rippled graduated depth makes it safe for birds and a pretty addition to your garden. Height 9 cm on feet. Diameter 34 cm. Made from high-fired frost resistant ceramic this gives further height to the Echoes bath featured above.